← Who Needs a Cubicle Instead of a Private Office? Scheduling repairs of any kind is a hassle for the busy executive. You have to stop what you are doing and take the time to find a reliable contractor who can fix your problem right the first time and keep the costs within budget tolerance for your company. Office chair hydraulic repair is no different. In fact, sometimes it is harder because not every office furniture company offers it. Executive teams often procrastinate chair repair for this very reason. They simply do not know how to coordinate repairs without costing the company even more money in lost time. Thankfully, there is Cubicle World. 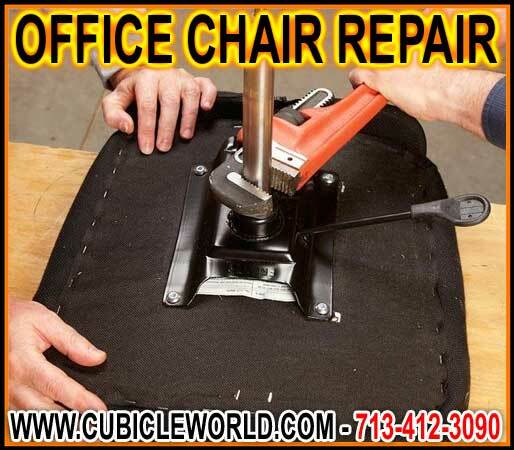 We are your one call source for all office chair hydraulic repair services. Cubicle World has our own fleet of trucks, and we own our own factory. We use only trained, trusted, and experienced employees in our refurbishing projects. There are no third party entities involved at any point of the workflow. Cubicle World handles everything from onsite estimation of costs, pickup of broken chairs, loaner chairs for temporary office seating, and return delivery. All you have to do is pickup the phone. Cubicle World can help you take advantage of any manufacturer’s warranties that may apply. Manufacturer warranties follow the product irrespective of who the original dealer was. If you bought an office chair from one of our competitors, it doesn’t matter. We can obtain replacement parts still covered by warranty from the same manufacturer. In some cases, companies are even surprised to learn that their office chairs are covered with a lifetime warranty. If you are one of these lucky companies, you might not need office chair hydraulic repair. You might just get new chairs. Call Cubicle World regardless of who you purchased the chair from and what you think the warranty is. Even if you have to pay for replacement parts, our costs are much lower than those of online retail stores. You basically pay for the labor and convenience of turnkey office chair hydraulic repair without any of the hassles associated with calling the manufacturer, tracking down special parts, and fiddling around with tools that look easy to use in videos but aren’t so fun to handle when you are trying to run a business or catch up on you rest over the weekend. Just let Cubicle World handle if for you. You’ll feel better when you sit down in a chair that feels brand new–at a fraction of the cost of new.